of California, Berkeley, United States. Throughout the world mountains are revered as mysterious places with the power to evoke an overwhelming sense of the sacred. For people of many different cultures, that mystery and sense of the sacred imbues their existence with meaning and vitality. Mountains may be considered sacred in several ways. First, certain hills and peaks are designated as sacred mountains by particular cultures or religious traditions and enveloped with myths, beliefs and religious practices. Second, a mountain or mountain range that may or may not be revered itself may be associated with the activities of holy persons or beings or may contain sacred sites such as temples and groves. Third, mountains that may not be considered sacred in any traditional sense may awaken a sense of wonder and awe that sets them apart as places imbued with cultural and inspirational value for particular individuals or groups of people. Many cultures revere mountains as high places, embodying lofty aspirations and ideals. 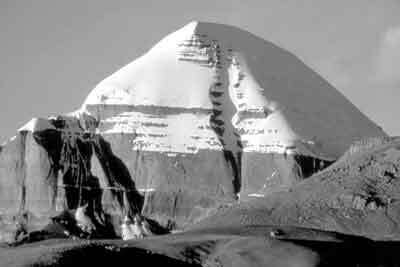 As the highest mountain on earth, Mount Everest has assumed the status of a sacred mountain even in the modern world. Its summit symbolizes for many the highest goal one can strive to attain, whether one's pursuit be material or spiritual. An extremely widespread theme is that of the mountain as centre - of the cosmos, the world or a local region. A number of mountains in Asia, such as Mount Kailas in Tibet, Autonomous Region, China, and Gunung Agung in Bali, Indonesia, provide the pattern for the mythical Mount Meru or Sumeru, which stands as a cosmic axis around which the universe is organized in Hindu and Buddhist cosmology. Many sacred mountains are revered as places of power. In the Bible, God descends on Mount Sinai wreathed in fire and smoke, the divine presence so intense that no one other than Moses could step on the mountain and live. For the ancient Greeks, Mount Olympus was the fortress of Zeus, the king of the gods who struck down his enemies with bolts of lightning. 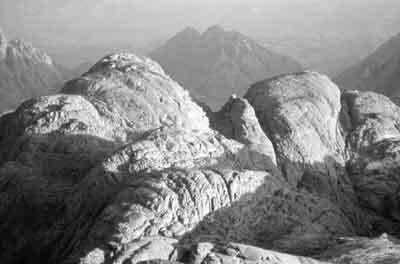 The power of many sacred mountains derives from the presence of deities - in, on or as the mountain itself. The Kikuyu of Kenya revere the summit of Mount Kenya as the resting place in this world of Ngai or God. Native Hawaiians regard Kilauea as the body of the volcano goddess Pele and object to geothermal drilling on the mountain as a violation of her physical Parvati, which means "daughter of the mountain". Many traditions revere sacred peaks as temples or places of worship. Tibetan Buddhists, for example, view Mount Kailas as the pagoda palace of Demchog, the One of Supreme Bliss. In the Judaeo-Christian tradition, pilgrims go to the sacred mountains of Sinai and to Moriah, the Temple Mount in Jerusalem, to worship in the places where Moses and Abraham responded to a divine call. Numerous people, both traditional and modern, view mountains as gardens and paradises - heavens on earth. Orthodox Christian monks refer to the sacred peninsula of Mount Athos in Greece as the "Garden of the Mother of God". Many hikers and climbers go to mountains as earthly paradises where they can find relief from the dusty grind of the modern world. A major theme links mountains to the other world as ancestors, often in connection with origin myths, and as abodes of the dead. Mount Koya (Koyasan) has one of the most impressive graveyards in Japan, located in a forest of giant cedars centred around the mausoleum of Kobo Daishi, the founder of Shingon or Esoteric Buddhism. The Maori believe themselves descended from ancestors who came to New Zealand in legendary canoes and went ashore to freeze into the mountains seen there today. As the bodies of frozen ancestors, mountain peaks in New Zealand illustrate the widespread theme of mountains as symbols of cultural and even personal identity. Maoris, at intratribal meetings, identify themselves first by giving their tribal mountain, then their lake or river and finally the name of their chief. The Puruha of Ecuador believe themselves descended from the union of Mount Chimborazo and his wife, the nearby volcano Tungurahua. Throughout the world people look up to mountains as sources of blessings such as water, life, fertility and healing. Hundreds of millions revere the Himalayas, the Abode of Snow, as the source of sacred rivers, such as the Ganges, on whose life-giving waters they depend for their very existence. Mountains such as the San Francisco Peaks in Arizona, United States, provide medicinal herbs and the blessings of water, health and well-being for the Navajo and Hopi peoples. In China, mountains were regarded as such ideal places for meditation and spiritual transformation that the ancient Chinese expression for practis-ing religion meant literally "to enter the mountains". Today many people in various parts of the world seek out mountains as places of artistic inspi-ration and spiritual renewal for the same reasons given by Guo Xi, one of China's most famous landscape painters, in the eleventh century: "The din of the dusty world and the confines of human habitations are what human nature habitually abhors; while, on the contrary, haze, mist, and the haunting spirits of the mountains are what human nature seeks". Sacred mountains have a special value that makes them worth protecting at all costs. Beliefs and attitudes held by people who revere them can function as powerful forces helping to preserve the integrity of natural environments. Because wildlife such as vicuñas are believed to belong to the Apus, the mountain deities of the Peruvian Andes, many indigenous people in the Cusco area refrain from killing them. 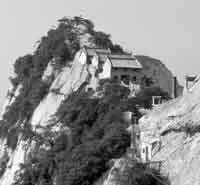 The Dai people of southwestern China regard their Holy Hills as gardens of the gods and set them aside as sanctuaries of biodiversity off limits to hunting and farming. Ideas and beliefs associated with sacred sites in mountains can also be used to help promote conservation, restore damaged environments and strengthen indigenous cultures. Indian scientists have been working with Hindu priests at the major pilgrimage shrine of Badrinath in the Indian Himalayas to encourage pilgrims to plant seedlings for reasons connected to their religious and cultural traditions. They hold planting ceremonies that allow people to enrich their pilgrimage experience by restoring an ancient sacred forest. Sacred mountains highlight values and ideals that profoundly influence how people view and treat each other and the world around them. In order to be sustainable over the long term, environmental policies and programmes need to take such values and ideals into account; otherwise, they will fail to enlist the local and popular support that they need to succeed.